Gov. 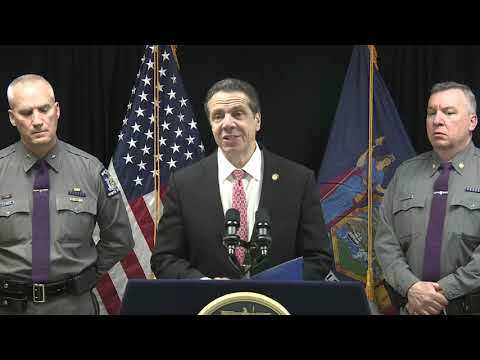 Andrew Cuomo and New York State Police Superintendent Keith Corlett joined forces to make a strong statement following the arrest of a Saugerties man for an anti-Semitic hate crime. "If you attack a Jewish person, you attack me. If you attack a Muslim person, you attack me. You attack an LGBTQ member, you attack me,” said Cuomo during the Friday, March 22 address. “That's the New York credo...Bias-related crimes, hate crimes, are not just wrong, they're not just unethical, they're not just immoral - they are illegal and we will prosecute every case to the fullest extent of the law. And that is my promise as Governor of the state of New York." The incident occurred at a store in the town of Ulster on Monday, March 11. A female employee of the store stated that she was in the cooler with another coworker when 21-year-old William Sullivan shut the lights off and made an anti-Semitic remark, saying, “You’re in the gas chamber now,” followed by an expletive referring to the employee’s Jewish faith. Sullivan was arrested and charged with second-degree aggravated harassment Friday, March 22 after an investigation.